Young women soaring, originally uploaded by The Bacher Family. Mount Rainier has a new urban outreach program called CAMP: Camping Adventure with My Parents. It to the Mountain families who have little or no previous experience with national parks, including these five young women, who are clearly enjoying their adventure! 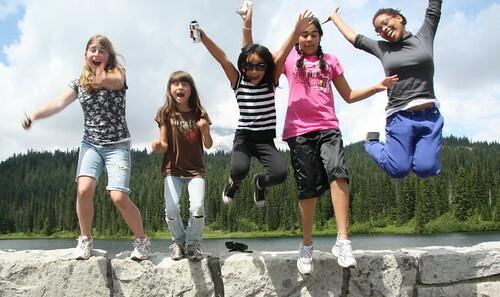 This is Quinn, Kelsea, Elizabeth, Karen, and Melissa at Reflection Lake.